Department of Orthopaedic Surgery, Mishuku Hospital, Tokyo, Japan. Received July 22nd, 2011; revised August 25th, 2011; accepted September 4th, 2011.
tion, and fracture pattern should be considered. with congestive heart failure when she was 86 years old. Her height was 147 cm and her weight was 46 kg. the secondary acetabulum above the original acetabulum. femoral head was severely deformed. bone format ion (Figure 2). hip on the ipsilateral side. cortical screws, was used (Figure 3). displaced fracture without bone formation. Figure 3. Postoperative radiograph of the left hip. the patient and her daughter. available and the prevalence of CDH was more than 3%. fracture, althoug h few reports have been pub lishe d.
Figure 4. Radiograph 2 years postoperatively. 78% at 10 - 20 years [7-12] (Table 1). tient’s age and cardiopulmonary status. had not complained of hip pain before the fracture. fragment and suf fi c i ent fi xat i on and st ren gth (ie, 50 mm ). associated with prolonged cast immobilization. than THA or arthrodesis in this patient. Table 1. 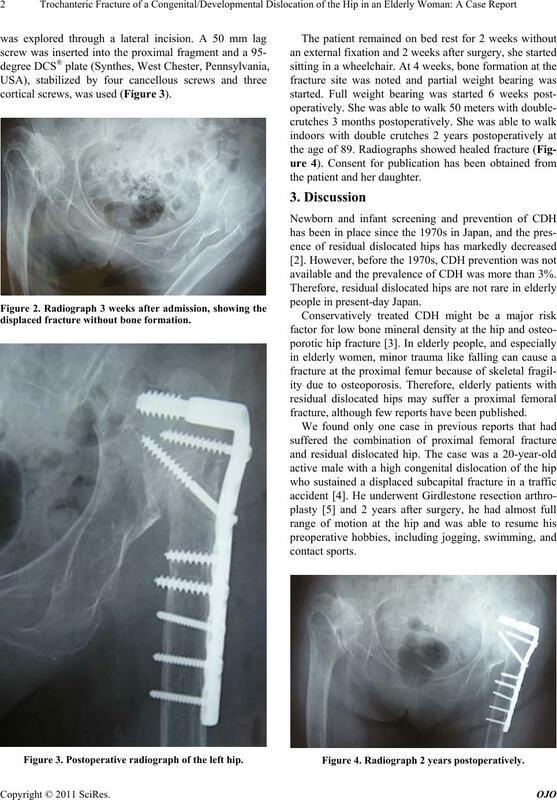 Summary of reported results of total hip arthroplasty in high c ong enital hip disloc ations. fracture pattern should be considered. Lancet, Vol. 1, 1943, pp. 419-421. Surgery, Vol. 58, No. 6, 1976, pp. 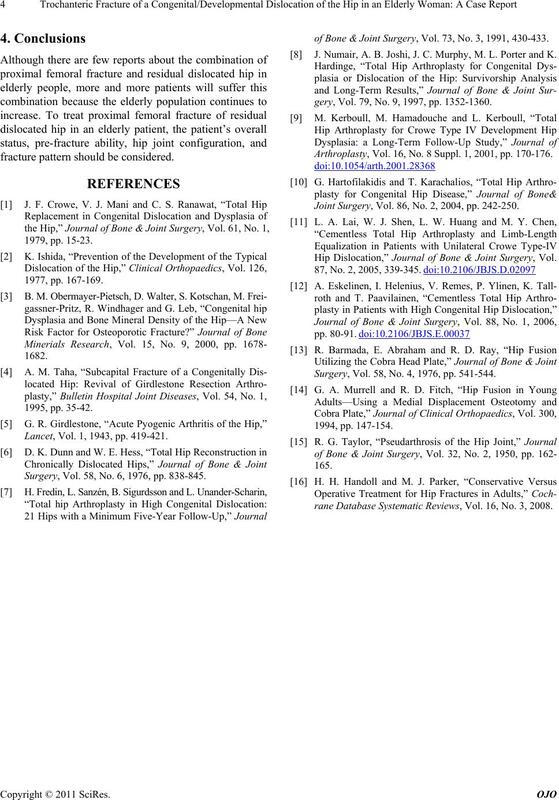 838-845.
of Bone & Joint Surgery, Vol. 73, No. 3, 1991, 430-433. J. Numair, A. B. Joshi, J. C. Murphy , M. L. Porter and K.
gery, Vol. 79, No. 9, 1997, pp. 1352-1360. 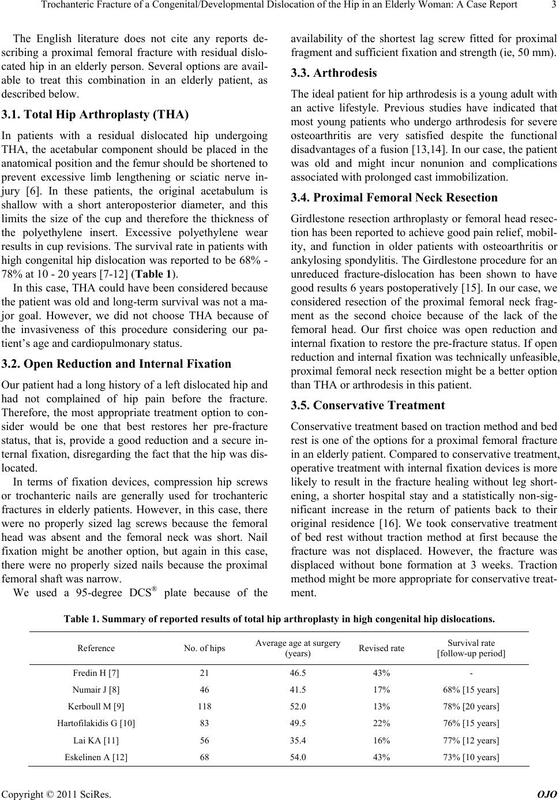 Arthroplasty, Vol. 16, No. 8 Suppl. 1, 2001, pp. 170-176. Joint Surgery, Vol. 86, No. 2, 2004, pp. 242-250. 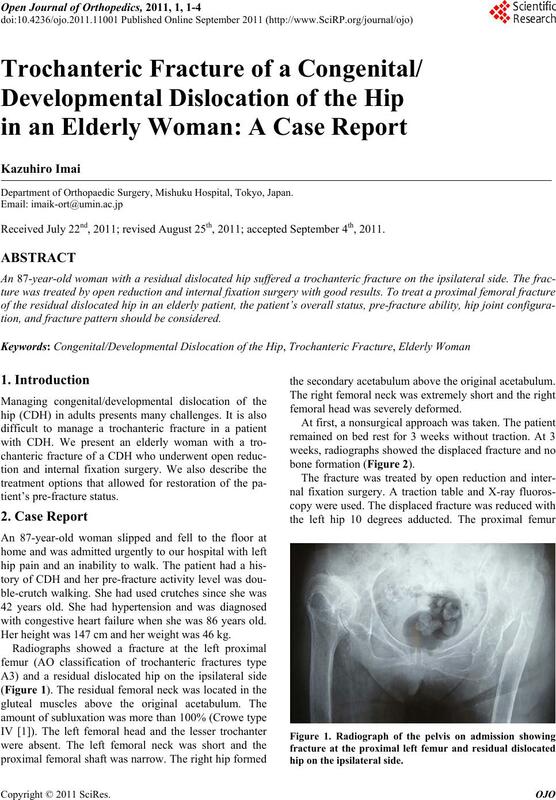 Hip Dislocation,” Journal of Bone & Joint Surgery, Vol. Surgery, Vol. 58, No. 4, 1976, pp. 541-544.
rane Database Systematic Reviews, Vol. 16, No. 3, 2008.